The domain name of the website has changed, and you will now be able to find it at Edibletropicalplants.com, and as always at edibletropicals.blogspot.com. There are many layout options when constructing a greenhouse. Many people prefer to have their plants individually potted and then placed either on the ground or on benches. Others opt for raised beds to plant in, while some decide to grow straight in the ground. Ground beds are useful for many purposes, but their main advantage is the ability to maximize greenhouse space. This is because ground beds offer more height for taller plants such as trees , whereas a raised bed will reduce possible growing height by the height of the bed. One of the major disadvantages of ground beds, however, is that they allow the roots of plants to grow through the garden soil into the native soil. This can be a large problem, especially if the native soil contains soil pathogens that are deadly to your plants. In addition, native soil is often more compacted and offers less nutrients. I advise doing some planning instead of making inaccurate judgments. Decide on how big of a grow area you want, and estimate how much soil and how many edge-stones you will need. Keep in mind that the plants you will be growing may not like the dirt that your greenhouse is built on. Therefore, if growing trees be sure to clear out about 3-4+ feet deep of dirt to allow room for the deep growing roots. Annuals and most low-growing perennials should be fine with as little as 1-2 feet deep of soil. There are many options when it comes to the soil that you will be cultivating in. It is important to pick one that is well draining and meant for garden use. These soils are usually have a higher sand content and less clay. Soils labeled "Garden Soil" would be ideal, but potting soil will work as well. Also, depending on what you plan on growing may affect your soil choice. For instance, when growing cactus, be sure to buy a cactus mix. So long as you are growing trees, shrubs, annuals, and most perennials, the typical garden soil should work just fine. 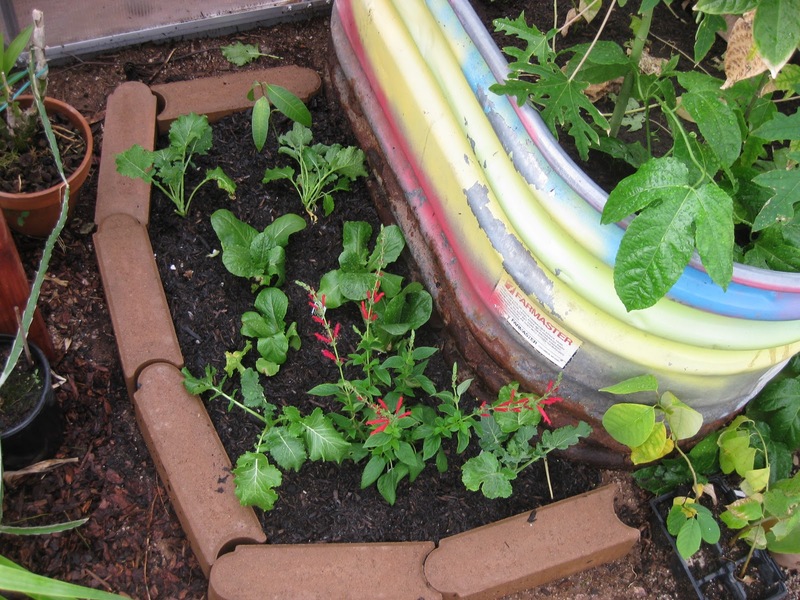 Again, keep in mind of what kinds of plants you will be growing in the ground bed and dig to an appropriate depth. Upon digging your bed, be sure to add a couple inches of gravel or rocks. This will provide drainage to the soil above. Some gardeners like to add a meshed material to place on top of the gravel layer. This helps preserve the drainage of your gravel by preventing soil from leeching. It is not required, but it will help in the long-run. Once your drainage layer is done, start filling the ditch with soil. Place edge-stones around the perimeter of the ground bed to prevent soil dispersion and to define the grow space. 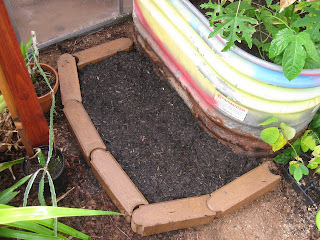 You may also choose to fill soil all the way to the top of the edge-stones making a sort of raised bed. If the soil has become compacted overtime it may inhibit the absorption of water and suffocate roots. To fix this problem you may add soil amendments which will recondition the soil and improve its quality. Alternatively you may till the soil using a shovel. This method involves the physical break up of the compacted soil returning it to a normal state. Mangoes come from a variety of species of trees in the Mangifera genus, the most common of these for commercial sale is the Mangifera indica. As far as germination and growth patterns, the mango is very much like an avocado. There is a pit in the middle of the fruit yielding only one seed, which should sprout just about a month after sowing. Mangoes come from trees, and often very large trees (over 100 ft tall in some cases) however growth is slow, so don't expect to be getting any fruit in the first five years. There are so many ways to grow this beautiful tree from seed, and most that I have tried seem to work well. One thing is for certain, you should plant the pit/seed as soon as possible after eating the fruit, this will ensure the best chance for germination. Also during the spring or summer is a good time to start planting mango seeds. Mango trees, and especially seedlings, are susceptible to frost damage and will be difficult to cultivate in any climate that receives annual freezing temperatures. You can circumvent this by growing indoors, or in a greenhouse, but in both situations the chances for fruit aren't too likely. You will likely need to have a greenhouse with a 12'+ height for any hope of actually yielding fruit. The last paragraph may have been disheartening for mango lovers living in temperate climates. One may still grow mango seedlings in indoor or protected locations within such climates. Additionally, as mango trees age their ability to deal with slight frosts may improve slightly. These odd looking seedlings will surely attract some attention sitting on a window-sill, and they make great conversation pieces as few people realize that mango seeds can be so easily grown into trees from commercial fruits. Firstly you must go buy a mango, at most grocery stores that I frequent they sell for between $.50 - $1.50+ depending on the season. To eat the fruit, remove the skin and either cut the flesh with a knife or simply eat around the inner pit as if you were eating an apple. You will notice a lot of fibrous strands coming from the pit, there is no need to remove these or any excess fruit remaining on the pit. You may either carefully crack open the very hard casing around the seed or you may leave the whole pit to dry out and simply plant the whole thing. Although the seed casing is very tough the seed within can grow a powerful tap root that will penetrate the casing and firmly establish itself in the soil before sending up the stem. Removing the seed from the casing will likely result in faster germination, but you will probably be waiting around a month either way. If you decide to break into the casing to remove the seed, you will need to carefully use a knife or a screwdriver to pry it open. This process reminds me of prying open clams, but be careful it can be pretty frustrating (and dangerous) trying to extract a mango seed. This is a pit from a freshly eaten mango. This is the same pit that has been dried out and pried open to recover the seed within. Once you have the mango seed all that you have to do is plant it and wait. 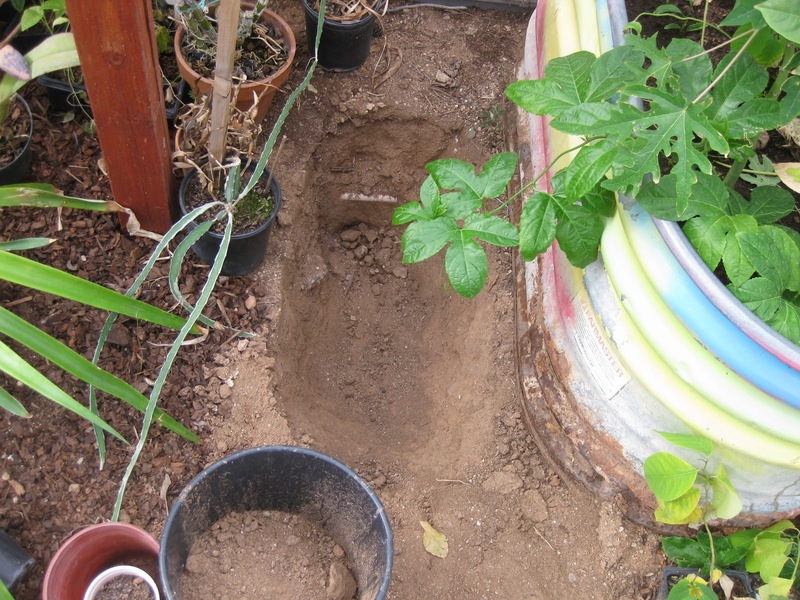 You will want to pick a well draining soil to plant the seed in, also avoid using shallow pots because they will inhibit the tap root's growth. I have found that mango seeds aren't too picky about how deep you sow them, but I would recommend around 1-2 inches (or 2-4 cm) deep. Whether your mango will survive and grow into a tall and prosperous mango tree has a lot to do on how well the seedling grows during the first year. Sometimes seedlings will get too dry, too wet, or have some kind of environmental problem which will dramatically hamper their growth. Perhaps poor genetics also play a role in seedling survivability. You will notice that healthy mango seedlings will grow fast, put out a lot of new leaves but also preserve old leaves. Seedlings that are in poor health will lose lower leaves faster, grow slower, and show 'burning' signs on leaves especially near the tips. From my experience, some mango seedlings just do better than others. Mango trees enjoy warm summer temperatures with high humidity and dry winters. At the seedling stage there is no need for the use of fertilizer and pests shouldn't be much of a problem either. Overall, mangoes are fool proof plants for a greenhouse as they are easy to grow, widely available, and relatively pest free. This is a 1.5 year old mango seedling that is in good health. It continuously puts out new sets of leaves on the top apex. Notice that there is still no branching. One of the most important sources of energy for plants is sunlight, but did you know that not all plants like the same amount of light? Tropical plants can be some of the pickiest when it comes to light requirements. In a rainforest most of the light coming from the sun is absorbed by tall trees, yet a small amount of light can get through which is absorbed by smaller plants near the ground. These plants below the canopies enjoy their shady environment, and in fact, thrive in it. Basically not all plants require the same amount of light. How do you know how much light a plant needs then? Often times nurseries will sell plants with labels that have their light requirements, if they don't, the internet is always a good source for this information. Most of the time you can just tell how much light a plant needs based on what kind of plant it is. Generally trees and tall plants require full sun while low to the ground plants generally like full or partial shade. Many plants can survive in shade or sun, but others are extremely sensitive and can be killed by too little or too much light. Fast growing annuals such as beans are a great example of a plant that will die without adequate light levels. This is because bean sprouts grow too tall and end up snapping their stem or falling over (in an attempt to get more light). On the other end of the spectrum, orchids can easily be harmed by too much light. In fact, light meters are very useful tools for orchid growers because different species of orchids require different levels of light. What does a photometer do? A photometer is another name for a light intensity meter, an instrument that measures the amount of light that it is receiving. This is very important because the human eye has a very hard time at distinguishing light levels. For instance, the difference in light levels in a well lit room compared to outside are huge. Inside my house, my light meter can hardly even register a few foot candles (a unit measuring light intensity), yet in the sunlight there is between 5,000-10,000 foot candles! So if you don't have a green brain, one of these light meters will help you decide where to put plants to optimize their potential. Below you can see the left picture was a reading taken from inside my house, while the picture on the right has the meter facing the sun. I haven't made a blog post in quite a while because I have had some greenhouse Issues. I lost most of my plants due to some unusually low temperatures this winter in addition to some greenhouse damages caused by some extreme weather. Recovery is slow and it's hard to find the time to work on my project at the moment, but new posts will be coming soon. Stay tuned for some DIY greenhouse projects and some new plant articles. Happy gardening!